Rand’s axioms: Existence exists. Now lets examine the Objectivist axioms, beginning with the axiom of existence. The Objectivist axioms are very instructive as to the dangers of an overly-speculative, rationalistic, largely verbal philosophy. Rand uses the vagueness of her axioms to confuse their tautological meaning with other more problematic meanings. This confusion is at the very heart of the Objectivist axioms. When we say that some object such as a cat or dog exists, we mean that they have a substantive, independent existence “in reality." Unicorns aren’t recognized as existing or as "real," because no such entity exists in the world of fact and matter. But although unicorns don't exist as real animals, they could be said to exist as an idea or an object of the imagination. If we accept that unicorns exist in this sense, we must also admit that this "non-real" type of existence is very different from the existence that dogs and cats enjoy. It will not do to conflate these two types of existence. When Objectivists insist that “existence exists,” in what sense do they mean it? In the cat and dog sense, or in the unicorn sense? So it would appear that existence is used in the unicorn sense. Existence exists merely indicates that something, however ephemeral, exists. It could be a mere idea or essence or image, entirely mythical, like the unicorn. If so, how can Kelley describe this idea as a “basic fact of reality” or equate the phrase existence exists with the phrase reality exists. If all that exists is a stream of essences trickling through consciousness, how can that be described as reality—or, even worse, as a fact of reality? If we examine all this from a foundationalist mindset (a mindset which Objectivists must honor if they wish to remain consistent), it is clear that the Objectivist axiom of existence fails to deliver what it promises. In the sense that it is foundationally true and obvious (i.e., in the unicorn sense), it is merely an empty, mostly irrelevant tautology. In the sense that it is meaningful, it is neither obvious nor self-evident, but is problematic and conjectural. Kelley describes axioms as “statements validated directly by perceptual observation.” While all sane people believe that existence exists in the cat and dog sense of the term, this belief is not “validated” by direct perceptual observation. Our belief in reality (and it is only a belief) is based on something far more complex and enduring than mere observation. A man, if he has drunk enough whiskey, may observe a pink elephant riding on a unicorn. Yet to say that this pink elephant exists because the drunk is conscious of it is to lapse into palpable idealism. It is only when we have brought intelligence and our practical sense of things (which is based on memory, the “validity” of which is deeply problematical and hardly self-evident) to bear on this observation that we can determine that it is far from real. To say that “something” exists in the unicorn sense of the term constitutes no great insight into the foundations of knowledge or reality. Who denies it? Objectivists are under the illusion that there exists this large contingent of philosophers that deny the axiom existence exists in the trivial, unicorn sense of the phrase. But strange to say, they cannot produce any such philosopher. The National Review's Jason Lee Steorts makes a good catch - and perhaps finds the underlying inspiration for Whittaker Chambers' infamous "To the gas chamber - go!" remark in his original review (Greg revisits Chambers' review here). 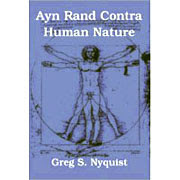 He points out that "Atlas Shrugged" does in fact contain a gas chamber - the ghastly Winston Tunnel scene, where those who are unfortunate enough to hold the wrong philosophical premises get death by asphyxiation, their final moments approvingly illuminated by the torch of Randian justice. Since Rand’s axioms cannot be identified without assuming memory, it would seem that memory would have to be included at the base of knowledge. So why didn’t Rand include it? Obviously, this is a major oversight on Rand’s part. If Rand had not failed to include memory as part of her “base of knowledge,” how would she have gone about “validating” it? Most likely, she would have resorted to the same trick as with her other axioms: she would have contended that any attempt to deny memory must first assume it. However, not only is this line of reasoning open to the objections I raised to it in the previous post, it has about it a sophistical flavor which would be far more transparent were it not used to defend views which all sane people accept. People tend to accept any argument, no matter how suspect, when it is used to defend core beliefs. To argue that a principle is “self-evident” and “axiomatic” because it cannot be “denied” without first assuming it involves presuppositions that can easily be doubted and challenged. It hardly forms a criterion of “self-evidence,” and it is mere presumption to contend that it does. For if it did, why didn’t Rand resort to it more often? She could have made use of it, for instance, in “validating” concepts: for isn’t it true that concepts can only be denied by first making use of them? Yet Rand did not make use of this mode of argumentation in validating her concepts, instead opting for an argument that featured even greater opacity. Why was this? Perhaps because even she did not have complete trust in it. The real error behind all this sterile rationalization upon which Rand attempted to build her metaphysics is the notion that matters of fact can be determined by logical, rhetorical, or moral constructions. Knowledge does not grow from such otiose web spinning. Knowledge arises to fill pressing animal needs, and grows and develops under the stress of the practical demands of everyday life and from scientific experimentation. Knowledge neither requires, nor can be justified, in logic or “self-evidence.” Foundationalism is as unnecessary as it is false and empty. Knowledge can only be justified (provisionally) either in daily practice or (better yet) through rigorous empirical (i.e., scientific) tests. Nothing is self-evident. Central to the Objectivist metaphysics is the notion that there are certain premises or “axioms” that are “self-evident.” This notion of self-evidence is at the very root of Rand’s foundationalism and must be challenged before we go any further. David Kelley defined an axiom as “a self-evident principle that is implicit in all knowledge.” How is an axiom “self-evident”? What does this self-evidence rest on? Objectivists resort to a rather strained argument that convinces only those who wish to be convinced. “An axiom is a proposition that defeats its opponents by the fact that they have to accept it and use it in the process of any attempt to deny it,” explained Rand [emphasis added]. In other words, according to Rand, an axiom is true and self-evident because you cannot refute it without assuming its validity. However, is this notion of how an axiom is true and self-evident also self-evident? And if it is not, how can Rand claim that her axioms are self-evident? Here’s one problem: Rand claims that every one of her axioms are assumed in the attempt to deny them. How does she know this? Is she familiar with all the potential arguments that can be essayed against them? Of course not: she can’t be familiar with every attempt to deny them. Therefore her assertion is based on a kind of inference—namely, an inductive inference. Now whatever Rand or anyone else thinks of induction, such inferences can hardly be reckoned as self-evident. Therefore, her very belief that her axioms can only be denied by assuming them does not carry with it the stamp of self-evidence, which her axioms require to pass muster. Kelley is guilty here of overstating his case. What he says about every argument for representationalism may be true of Descartes and Locke; but it’s hardly true of the American critical realists, of philosophers such as Arthur Lovejoy and George Santayana. Representationalism, to such philosophers, is merely an obvious corollary to the basic notions of realism. If both consciousness and matter exist, the perception of matter by consciousness must be achieved through some kind of medium, since a physical object cannot literally enter into consciousness. And since through experience we know that people have percepts, concepts, ideas and other mental datum that are obviously not identical with whatever material objects they may be associated with, representationalism, for the realist, becomes de rigueur. Objectivism, despite its rejection of representationalism, is, implicitly, a representationalist philosophy. Nearly every philosophy is at least implicitly representationalist. The only exception would be a philosophy that preached the solipsism of the present moment. As long as the philosopher believes that one idea or concept can serve as a symbol or a sign for something other than that idea or concept, he is, at least implicitly, a representationalist. Rand believes in concepts that are not identical to their object in reality. Therefore, she is a representationalist. Most idealists believe in time, that is, in a past and a future, and in a memory that can know the past. But what is memory but a representation of what is not present in consciousness? Therefore, idealists are representationalists as well, at least in terms of the past. Why does Objectivism reject representationalism? According to Rand's chief disciples, representationalism (allegedly) holds that individuals can only know their representations—that is, the sense data perceived by the mind. The objects in reality that this sense data “represents” are “unknowable” (as Kant argued) and at best can only be inferred. In short, representationalism cuts the mind off from reality, leaving the mind only with the representations. Now this is a caricature of representationalism inspired by the confusions of Immanuel Kant. Philosophers such as Kant believed that knowledge should be certain, and so they were driven to ask the question: If I know things only by representations, are not the representations the only things I know? Rand and her disciples take an entirely different approach to the question If I know things only by representations, are not the representations the only things I know? They simply evade it. Objectivism claims that human beings have direct awareness through perception of external objects. For an Objectivist, direct means: without conceptual processing. This, however, merely evades the problem by redefining the term direct. What is at issue is whether perception uses representations: and all the evidence available to us suggests very strongly that perception is every bit as symbolic and representative as is conception. The very fact that a percept is not identical to its object establishes that the percept is a representation. Visual perception clearly brings forth, within the mind, a field of images. If there exist any doubt on this subject, one merely has to observe that the lens and cornea of the human eye actually invert or turn the image displayed on the retina upside down. The brain then proceeds to turn the image field right side up for viewing in the field of consciousness. Hence what we “see” “directly” in consciousness are images, not the physical objects. After all, the mind, when it flips the image field right-side up, does not flip right side up the real world. It flips over a field of representations. Moreover, if individuals are told to wear special glasses that reverse the field of vision, so that the image is displayed on the retina right-side up, while they at first perceive the world as upside down, if the wear the glasses long enough, the brain automatically reorientates the field of vision right-side up. So visual perception can hardly be seen as “direct.” Consciousness, before it can become aware of material objects, must translate the data read by the senses into a language that the consciousness can read and interpret. The point of perception is not to duplicate or mirror physical objects, but, as Santayana put it, to express “some true relation in which that object stands to the self.” Representationalism, far from rendering knowledge impossible, provides the explanation of how it is that one mode of existence (i.e., consciousness) can become cognizant of a very different mode (i.e., the physical world). Those who equate representationalism with “knowing only our representations” are guilty of making a false demand of knowledge. They demand that knowledge be certain and direct. Knowledge is no such thing. Knowledge attempts to make us aware of objects existing outside of consciousness. It is transitive and symbolic and conjectural right from the very start. Whether described as “perceptual” or “conceptual,” knowledge is indirect, mediated by symbols, which help reduce physical objects to a scale amenable to human intelligence. No logical proof or foundationalist rationalization can validate this indirect, symbolic knowledge. It involves a conjectural leap. We must take nature by the hand, and assume the symbols which arise in consciousness represent objects or events in a physical world. Once we take this leap, we will find our faith justified, not by logic, but by praxis. It is the practical necessities of life, the urgent biological needs of the human organism, that force us to take this conjectural leapand become tacit and practical realists, despite whatever foundationalist or idealist misgivings we may entertain.